It happens every year—winter hits and the flu arrives, sending staff members and co-workers home with nasty coughs, congestion, fevers, and body aches, among other symptoms. We all chalk it up to the fact that it’s going around, but most of us don’t even realize that many of the germs and viruses that are causing illnesses are living within the workplace, in places that you don’t even suspect, but yet you touch and come in contact with every day. Believe it or not, one of the biggest hotbeds of bacteria and germs is the office photocopier/scanner. Think about how many times you and other staff members hit that button in a given day. And according to numerous studies, the start button on an office copy machine is home to 1.2 billion CFU (colony forming units) per square inch. To put it in perspective, the average infestation for a school toilet seat is about 3,200. You may look forward to that first cup of coffee when you get to work, but the coffee pot handle is just teaming with germs ready to infect. Researchers have found that not only do coffee pot handles make a great home to CFUs, but they are also accommodating to those streams of viruses that are resistant to antibiotics. With an average of 108 thousand CFUs per square inch, the office coffee pot is an illness instigator you may want to avoid. Taking the stairs instead of the elevator is always a great choice since it gets your heart rate going and gives many folks a little bit of exercise they might not otherwise have. 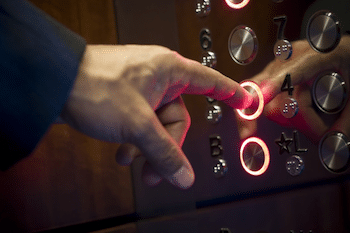 But did you know that the elevator button is home to millions of microbiological units? Swabs done in numerous office elevators, including a hospital, found that the buttons were covered with CFUs. We’ve all heard the warnings about touching door handles in public places, especially those leading to restrooms. But office door handles are no cleaner, and it may surprise you to learn that the bacteria and viruses that can infect an entire staff are living on door handles and can be spread within hours. If you think about how many people come in and out of certain doors in your workplace and how often you turn certain doorknobs, the rapid rate of possible infection makes sense. How many times a week do you bring in lunch that needs to be heated up in the microwave? Just like the handle on the coffee pot, the buttons on the microwave are a hotspot for germs and they are less likely to be washed or wiped than most items in an office break room. Colds, flu and stomach viruses are always going to be lurking—but armed with the knowledge of where many of the germs that cause them to live, you can protect yourself from infection. For more health and medical information, remember to check our blog often. All Points Medical Waste is committed to being a valuable resource when it comes to these topics. For medical waste disposal, get in touch with us today to learn more about what we do. We are a full-service medical waste disposal provider serving Indian River, St. Lucie, Okeechobee, Martin, Palm Beach, and Broward Counties.